David Price (SP - BOS) Veteran lefty David Price did not factor in the decision as the Red Sox edged his former team, the Rays 3-2 in 12 innings Thursday. Price went seven innings, allowing zero runs on three hits, while striking out five and walking three. Over his first 14 innings of 2018, he has yet to allow a run, while sporting a less than spectacular 10/6 K/BB. Despite this, he has been effective on the mound, as his 1.53 FIP illustrates to this point. Allowing just a 26.2% hard contact rate helps as well. Coming off an injury plagued 2017, the 32 year old was a prime bounceback candidate who came at a reasonable price in drafts. His next start figures to come against the Yankees at home Tuesday, where he will look to extend his scoreless innings streak. Adrian Beltre (3B - TEX) The future Hall of Famer was 2 for 3 on the day, raising his line to .241/.290/.345 on the young season. He didn't knock in any runs on the day, however, the 38 year old added another big accolade to his list of accomplishments. 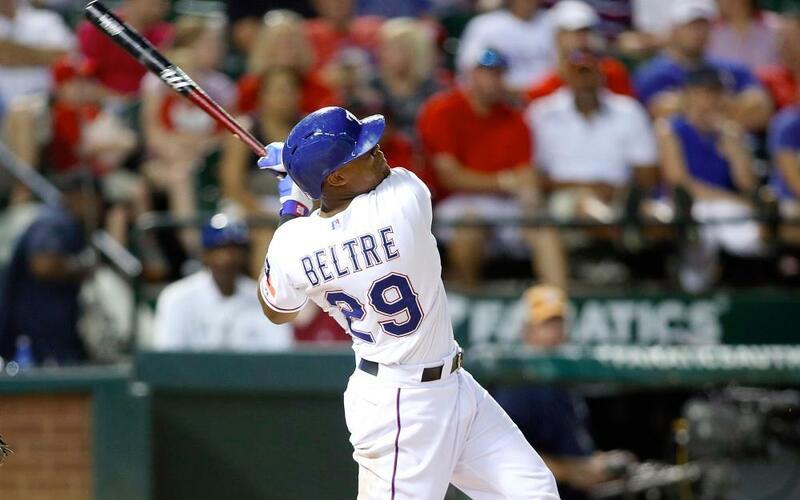 Beltre became the all time hits leader among latin born players, passing up Hall of Famer Rod Carew. Despite heading into this season at age 38, Beltre can still be a solid fantasy asset, as long as he can stay healthy, which always becomes a concern for a player in his upper 30s. Meanwhile, enjoy the greatness that we are lucky enough to witness. Miguel Sano (OF - MIN) The Twins' slugger cranked his third homer of 2018 in their 4-2 victory over the Mariners Thursday. Sano is off to a solid start despite all the question marks that surrounded him in the spring. With a .280/.333.720 line, the 24 year old seems to be unaffected by any of it. Peripherals are shaking out as you would expect for the slugger, as his K% is at 48% so far, which is high even for Sano, and figures to normalize to his regular 36% career mark. He will need to become a bit more patient at the plate to raise his current 7.7% BB% to his career mark of 12%, which makes the K's a bit easier to tolerate. With a career wRC+ of 125, he produces runs in the Twins lineup, which equals production in your fantasy lineup. James Paxton (SP - SEA) Did you have a bald eagle land on you at work today? Didn't think so. Paxton did, and if you haven't seen it, do yourself a favor and search it up. In addition to the giant bird landing on him, the lefty went out and threw five innings, allowing two runs. Paxton struck out seven White Sox, and walked just one, while giving up four hits. The strikeouts are there, as always, as evidenced by his 10.24 K/9, but the 4.66 BB/9 is alarming at first, but today he walked just one in his five innings. With a career high IP of just 136, if he can reach the projected number of 160, which most systems have pegged him for, it will be a welcome sight for fantasy owners in 2018. He may not be a front line ace, but when healthy, there are few arms in fantasy that can give you the strikeouts Paxton can. Matt Davidson (3B/DH - CHW) Davidson went 2 for 3 with an RBI and four runs scored in the Sox 9-7 win over the Tigers Thursday. After the frenzy he caused on Opening Day by hitting three long balls, the 27 year old is out to show he is legit. Coming off a 2017 in which he hit 26 home runs, but did little else, it is tough to trust him. After the first week of the season, he is slashing .318/.444/.909. Based on his minor league track record, he figures to be more of the 2017 player than what we are seeing now. A 30% K%, 5% BB% and a low OBP figure to be where he finishes, even if he does have 30 homer potential. Sell high boys and girls!! !